Courtesy Jes Ruvalcaba Rotary LOCAL fulfills teachers’ pedagogical needs—no questions asked. Patricia Wheeler needed a skeleton. She had just inherited an anatomy class at Palo Verde High School where she taught, and the model skeleton the classroom was equipped with was falling apart. James Mandolini, the coordinator of Rotary LOCAL, a program run by the Rincon Rotary, had a skeleton sitting ten feet from his desk at work. When Mandolini's radiologist boss, Phillip Berman, died, he had left behind a human skeleton that he used in his medical practices. Mandolini approached Berman's widow, Judy Berman, who said her husband would love for the skeleton to go to a high school classroom to help kids learn. That was about a year ago, and the skeleton, now named Pepe, is still in Wheeler's class. She said Pepe hasn't just impacted a lesson or two, but has transformed the school's culture into one where kids are excited about learning. "The kids, oh my gosh, I can't even tell you how much they honor the experience," Wheeler said. "It gave so much value to our program that someone would recognize that high schoolers are worthy of something that could be at a medical school." It certainly is valuable. Rotary LOCAL fulfills grant requests from teachers all over the city, from Marana to Vail, usually for around $500. Wheeler already felt like she was aiming a little high in her request for a plastic model, which run between $800 and $1,200. Mandolini said that real human skeletons cost a minimum of $5,000 (although a quick, curious scroll through skullsunlimited.com turns up a bargain-priced $4,800 skeleton, while supply lasts). This is how Rotary LOCAL works. The project, which has competed 92 grants in just under three years of existence, gives teachers what teachers say they need, not what the club, or anyone else, thinks they need. It all started three years ago when Mandolini, now coordinator of Rotary LOCAL, and John Lee, a member of the vision committee and former Rincon Rotary president, were talking about teachers over beers at Risky Business. Lee's wife used to be a teacher, and Mandolini's wife still is. "They need so much, and they work so hard," Mandolini says. "It's almost surreal how much they can use." Mandolini has two children and works as a computer programmer, and it makes sense if you've met him. He's quick, sharp and talks fast when he's excited about something. Lee is a father to four, tall and soft spoken with a deep voice. With Mandolini to build the website and Lee to work on fundraising, they were in business. "I argue that teachers actually know what they are doing. They just need the resources," Mandolini said. "For some reason, teachers are highly educated and people don't trust them. We do." Case in point: Jessica Pierce, a school counselor at Lineweaver Elementary, put in a request for a Buddy Bench, which kids can sit on when they're feeling lonely, signaling to their peers that they could use a friend. Mandolini was talking to fellow Lineweaver dad Greg McPeak one day, and when Mandolini brought up Rotary LOCAL's latest grant request, McPeak mentioned he was a hobbyist metalworker and offered to donate his services for the project. "When you actually approach the local community, they're like, 'You need a bench?! I'll build you a bench!'" Mandolini says. 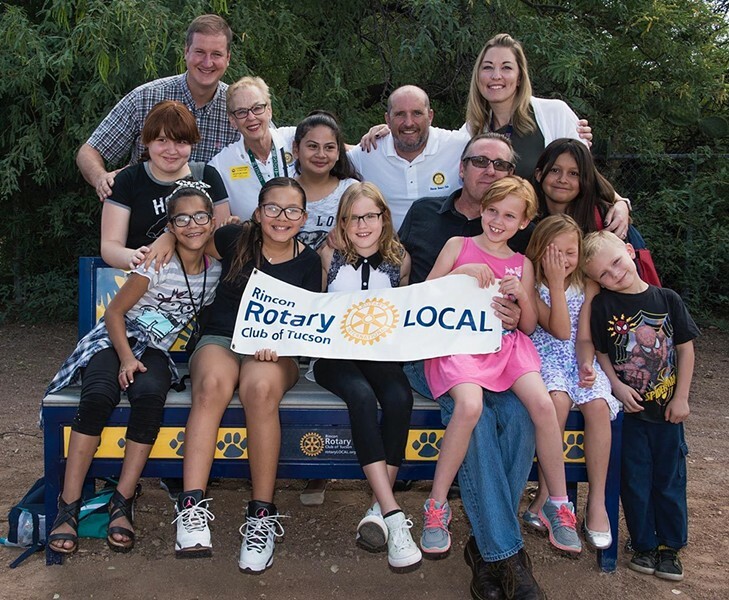 Fifty hours of volunteer work, the incorporation of artwork by children at the school and one Buddy Bench Later, McPeak helped the Rotary make it happen. "It's kind of cool," McPeak says," Because I was able to give something back to school that my kids have kind of gotten their education from." Pierce says the bench has been a hit, and that it's sweet to see the kids jump up to use it the way it was intended. "'Someone's on the bench! Let's go!'" she gave an imitation. "It's actually become a really big staple in our little community." Using local sources to fulfill grants is another one of Rotary LOCAL's mission. There was the time that the group fulfilled a grant for 20 guitar cases for Patty Frey, a resource teacher at Bloom Elementary. The school provided guitars for an after-school program, but students who had guitars at home to practice on were improving much faster, and Frey wanted to give everyone that opportunity. She applied for a grant with the Rotary and got the guitar cases in less than a month. "It really made a big difference because once everyone could take a guitar home, the whole quality of the program really improved," she said. Mandolini said that the secret was the Rotary's partnership with Instrumental Music, which also helped Rotary LOCAL out with several other grants. The store provided the cases to the club for a hugely discounted price: less than $500. "That sort of enlightened self-interest from the business community has been incredible," Mandolini said. "Our mandate is to help local teachers, help local students and try to spend that money locally." Sometimes the requests are simple, like when Sylvia Aramburo, a fifth-grade teacher at Elvira Elementary, requested 128 two-inch binders for the whole fifth-grade class, in order to take the cost burden off parents. Rotary LOCAL fulfilled the grant through Gibson's Office Solutions. "It was just an incredible blessing," Aramburo says. "I guess it's really simple, but for us, it's teaching them organization." This is why Mandolini says we need to trust teachers. Sometimes they do need books or pencils, like people might expect. But sometimes it's a bench, or empty guitar cases, or a skeleton. "You just meet these incredible people that are really doing incredible work in Tucson, and it seems like their story never gets told," Lee says. "It's nice to have a group that we can help make a small difference, kind of one teacher at at time." Most of the grant money from the Rotary Club comes from their Taste of Chocolate Fundraiser, taking place next year on April 15 at Doubletree Reid Park. For more information, or to apply for a grant, visit rotarylocal.org.